The thing that bothers me about this cartoon by one of my favourite subversive thinkers, Hugh Macleod, is not the message. Hugh's cartoon is poignant. It speaks the truth. It's from his soul. And I think the message is clear. What bothers me is how the cartoon has been absorbed. 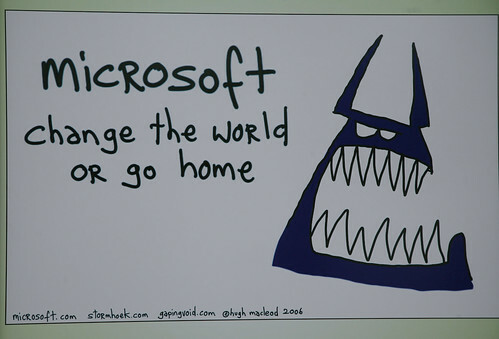 Option #1 Upon seeing this cartoon, Microsoft PR could have gone rancid. Ballistic. Ignored or shut down. Or worst, ceased and desisted. That's the 'clueless' answer we half expect companies to do. And we loooove to call companies on this...use big examples of how these old skoolers just "don't get it". Have we totally stopped talking about Kryptonite already? (I still pick up on the meme) But companies, and especially companies like Microsoft, are not stupid. And their PR people are even less stupid. They haven't spent years of building 'evangelist' teams of people to do community outreach to end up blowing it on something like this. Option #2 is that they read it, reflect and realize that they need to do something about this. Not shut it down, but it actually gets them thinking, "Man, maybe it is time to change. Maybe we aren't relevant anymore. Maybe we've just got too mired down in being big company that we lost our edge?" and they could start actually doing something about it. It doesn't appear that is the case. There is a third Option, though, and, in my estimation, it is the scariest option of all. Option #3 is akin to systemic or implicit prejudice. It's there...you can feel something is wrong, but there isn't something explicit enough to be able to call anyone out on it. "Wow, they are so smart. Look at all of us visiting their site." "I think I just increased my respect for GM. They DO get it." Which made me stop and shudder in a big way. You see, by taking on the subversiveness of those ads, they appeared as if they 'got it'. They appeared as if they were doing Option #2. Now, time will tell whether GM gets rid of this line of enormous vehicles and replaces them all with more fuel efficient, hybrid or electric vehicles, but the issue I take with the outcome of all of this is that a simple PR move totally quieted the critics. They neutralized by taking the punch. Which is what Microsoft is doing here. Whether or not they are actually 'changing the world or going home' is up for deep debate and discussion, but when they showed up at the Web 2.0 Expo sporting this cartoon all over t-shirts and signage, I was taken aback. The PR people were standing at the door to the MS session, happily handing out their (men's XL & XXL) tshirts to everyone coming into the session. A big smile, saying, "See? We're hip. We're listening," across their face. Meanwhile, we were running the Web2Open across the hallway and had spoken with some Microsoft people a week earlier about them coming down and being involved in the Mashpit. "Bring developers and your APIs." I offered and added, "This is for the developers and the community, so we aren't 'featuring' anyone. We'll let people decide what they are working on." Well, no developers showed up, but those same t-shirt flingers were more than happy to 'spam' our tables with Microsoft literature as they ran by. It seemed to me that the appearance of clued in was much more important than being clued in. And could you blame them? I mean, being clued in is a terribly time-consuming, drawn-out process that takes a long period of humility, pain and general deprogramming. Whereas, appearances are pretty simple. All you need are a stack of gapingvoid t-shirts and a heartfelt speech. I do have the utmost faith in human beings...still...even after all of these years of hearing people say one thing, then do something else. And still, even after watching so many people around me fall for the line rather than judge by the performance...still, I think that people are smart and can see these inconsistencies for themselves. But this is a cloak. The cloak of subversion is strong. And the strongest part of it is that we, ourselves, want to believe SO strongly that stuff is changing this fast. We want our stories to carry into our clueless clients' offices and say, "See? Microsoft is doing it. Why can't you?" I do believe that times are changing...companies are changing (or have to change). I believe the tide is shifting and there will be a great leveling (in fact my book proposal, which is coming along nicely, thank you, is about this very belief). But I don't believe it is happening as fast and led by the characters that we are pointing to. We, too, have to change our own measurement systems to see where things are making leaps and bounds and it is truly, in the individual stories and the long tail. Subversion...REAL subversion is going down. And it is kickass, amazing, disruptive stuff. But it will: a. take some time to shake out and b. come with some crazy consequences we don't even realize yet. And it isn't as simple as GM keeping Tahoe-bashing ads up on their site longer or Microsoft using a cool Hugh Macleod cartoon on their conference materials. Subversion isn't a marketing tool. It's a path to change. We can't lose site of that.